Federal agencies continue to demonstrate their intent to enforce silica dust regulations on job sites and at the workplace. Business owners and managers are often suspicious of new regulations. This skepticism is often based on the sheer number of new enforcement actions that are introduced on an annual basis. For concrete and demolition recyclers, a pending United States Occupational Safety and Health Administration (OSHA) regulation regarding airborne silica dust has been among the industry’s most discussed guidelines over the past decade. The regulation has continued to move through the discussion (and legal appeals) stages and into the realm of enforcement. Recyclers and contractors who handle concrete and other aggregates-based materials needed to be ready to comply with some aspects of these OSHA regulations by June 23, with others are being phased in by June 2020. The pertinent regulations compel companies and employees to comply with OSHA rules as they apply to worker exposure to respirable crystalline silica. Conscientious employers take measures to protect workers against inhaling all kinds of dust, but some concrete dusts with considerable amounts of crystalline silica provide an extra reason for precautions. Beyond the legal and financial considerations of enforcement, employers have to contend with health consequences of worker exposure. Crystalline silica is considered a known carcinogen and can lead to silicosis, a chronic disease that scars lung tissue. OSHA estimates that as many as 2 million construction workers have been exposed to silica dust by breaking, sawing and mechanically crushing some types of sand, stone and artificial stone. Chronic silicosis is described by the American Lung Association as a disease that starts with a cough and breathing difficulty, potentially followed by “chronic bronchitis-like symptoms [in which] the lungs have additional sounds called wheezes and crackles.” Lung tissue scarring can continue over time, leading to “signs of chronic lung disease such as leg swelling, increased breathing rate, and bluish discoloration of the lips,” according to the association. A 2014 blog post on the Centers for Disease Control (CDS) website indicates kitchen and bathroom countertop materials marketed as quartz surfaces “may contain up to 93 percent crystalline silica,” and workers who fabricate, install or dismantle and demolish these stone-like countertops may be at particular risk. The percentage of crystalline silica in concrete’s aggregates is likely to be closer to the 30 percent range. One estimate of crystalline silica in demolition dust published by an Australian state’s workplace health and safety agency estimates the substance’s presence as being in the 3- to 4-percent range. The problem for demolition contractors and aggregates recyclers is that while silica dust concentrations are smaller in the materials they process, the volume of material being crushed or pulverized is much greater. As with any new legislation, how and when the silica dust regulation gets enforced by agencies will almost certainly evolve over time. the use of walk-behind saws indoors or in enclosed areas. In cases where the silica levels are likely to exceed that, employers may be obligated to provide workers with respirators. Such areas must also be marked with signs spelling out the respiratory danger, rule 1910.1053 states. building enclosures that isolate the work process or the worker. In addition to the operational preventive measures, business owners and managers whose tasks include compliance are charged with recordkeeping obligations pertaining to the OSHA silica dust rules. A Denver-based entrepreneur who moved from the demolition sector into the software industry says a lack of these record-keeping aspects can penalize even the most well-intentioned employers. Speaking to Construction & Demolition Recycling earlier in 2018 about regulations affecting the remediation sector, Roni Szigeti, CEO and founder of the Denver-based FieldFlo, said employers who have taken every measure possible to protect workers from harmful substances can still encounter significant trouble if documentation is incomplete. OSHA indicates it also provides compliance guidance to companies that are impacted by the new rules, including on a section of its website devoted to the topic. “OSHA can provide compliance assistance through a variety of programs, including technical assistance regarding effective safety and health programs, workplace consultations and training and education,” says the agency. During these processes, consultants from state agencies or universities work with employers to identify workplace hazards, provide advice on compliance with OSHA standards, and assist in establishing and improving safety and health management systems, according to the agency. OSHA says more information on the service can be found at www.osha.gov/consultation. Although it is uncertain how these silica dust mandates will be enforced, the history of regulation might lead recyclers and contractors to conclude that taking proactive preventive steps—whether through the agency itself, by contacting a trade association or through a software vendor or consultant—can save considerable troubles down the road. Ensuring landfill operator and customer safety starts with the landfill’s design. Landfill safety starts with intentional design. Landfills are complex operations with many hazardous environments, physical settings and people and equipment interactions that can pose risks to landfill workers and customers. However, through more intuitive design considerations, today’s professionals can help eliminate unsafe configurations and institute features that can proactively warn of and minimize hazards. Slope angle is a critical design parameter that determines the shape and available capacity of a site. There are the obvious factors, such as slope stability, that govern the maximum allowable slope angles of interim and final slopes as well as regulatory limits that influence maximum slope angles in a site. 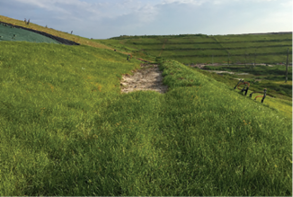 Designers must consider subgrade conditions, geotechnical factors and regulatory requirements when specifying how steep a landfill can be constructed. 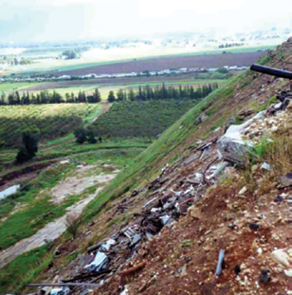 Steeper slopes increase disposal capacity. As such, owners often push landfill designers to go as steep as possible with the slopes to maximize disposal capacity. The downside is that steeper slopes can pose increased hazards for maintenance and monitoring. Figures 1 and 2 on Page 33 illustrate steep and moderately sloped landfill configurations. Steeper slopes make mowing and maintenance of the sloped areas more difficult and dangerous. There are plenty of examples of overturned tractors and other heavy equipment mishaps occurring from operators mowing or working on slopes with aggressive inclines. In addition to slope configurations, designers have to ensure easy access to important monitoring points and environmental control features such as landfill gas wells, condensate sumps and leachate sumps. Steep slopes can increase the difficulty of accessing and monitoring these features. Design criteria should consider the practical aspects of using equipment and potential personnel limitations during all phases of the landfill life to account for changing configurations. Many states regulate the maximum design slope that can be constructed before settlement while other states allow slopes to be constructed greater than the design limit to allow for settling back to the maximum allowed slope. In the latter case, if the maximum allowable final slope is 4H:1V, the operator might construct to 3H:1V or steeper and allow the slopes to settle back to 4H:1V. As an example of state requirements, Pennsylvania specifies a maximum slope of 3H:1V. However, use of a settlement accommodation plan allows for construction of slopes greater than 3H:1V to a maximum of 40 percent as long as the slopes settle back to a maximum of 3H:1V within 5 years and the maximum permitted height is not exceeded by 10 percent. Pennsylvania also requires terraces be installed every 25 vertical feet if the slopes are approved greater than 15 percent. The risk of this type of design is that if the slope does not settle back as anticipated to a maximum of 3H:1V, waste material will have to be removed to ensure compliance. In contrast, Virginia has no such settlement accommodation provision. Although 3H:1V slopes are relatively steep and pose some challenges for mowing and monitoring, especially in wet, icy, or snowy conditions, operators have been able to deploy equipment to maintain and mow these steeper slopes safely. Although state laws vary, it is up to the designers to take practical, safety and regulatory considerations into account when establishing the configuration of a landfill. Most landfills have monitoring points for groundwater and surface water. Some of these monitoring points can be in remote and difficult-to-access areas. That’s why site access for safe environmental monitoring should be a design and operational consideration. Designing all-weather and maintainable access paths and establishing clear markers for these monitoring points can improve access safety and ease of monitoring. Figure 3 on Page 34 shows a challenging access configuration on an older closed landfill, and Figure 4 illustrates a better-defined and safer access example for monitoring on a newer landfill. In Figure 3, there are no defined paths to the monitor wells, consequently mowing of the vegetation is infrequent, and ropes are needed to safely navigate from the top of the landfill slope to the bottom of the slopes to access the monitoring wells. 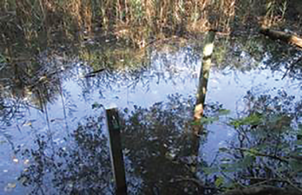 Finding the monitoring wells can be a challenge, and the overgrowth of vegetation creates an environment friendly to snakes, mosquitoes and ticks. Figure 4 depicts a safer monitoring point configuration. The well is clearly marked, the area is free of debris and the monitoring area is protected from damage with bollards and a concrete collar that is easily accessible. Considering these features during the design process makes monitoring the landfill probes and the landfill groundwater, surface water or subsurface gases less costly. Simple and clear signage is a design element sometimes overlooked. Entering a landfill facility can be confusing for citizens. Questions regarding where to go in relation to the scale, the location of the active disposal area and the citizen drop-off area, and any vehicle restrictions that are in place can lead to unsafe behavior. Clear, large and visible signage is helpful for site users in explaining where they should go and how they should operate when navigating a landfill. For these reasons, the signage should be an important consideration during the design process and should be adjusted in the field depending on site operations. Large garbage trucks and smaller passenger vehicles enter landfills daily. Safe landfill design protocols provide for the separation of these vehicle types through the presence of separate disposal areas. Distinguishing two areas for citizens and haulers helps minimize potential collision hazards in a busy, comingled dumping area. Many municipalities and private companies provide a safe disposal environment for the public using citizen convenience disposal areas away from the landfill itself. The design width, surfacing material type and presence of traffic speed control measures can help create safer driving conditions. Specifically, sufficiently wide roads allow for safe two-way traffic between larger trucks. This helps prevent turnover that can occur when a truck is forced to move off the roadway edge on to softer landfill areas. Citizen convenience centers keep public traffic separate from the large commercial and municipal collection vehicles that deliver waste to landfills. Despite design considerations enforced by the U.S. Department of Labor’s Occupational Safety and Health Administration (OSHA) and other regulatory bodies, the design of these facilities can still pose unique safety challenges. Many of these facilities have elevated areas from which the public can unload into roll-off containers, which are located 8 to 12 feet below where the vehicles pull up. The primary hazard is citizens falling into the roll-off containers from the unloading area. Design features such as walls, railings and signage can help protect customers from slipping or otherwise falling into dumpsters. Designing these facilities on a grade can also help eliminate these fall hazards. Safety concerns can arise during the construction of the environmental control systems at a landfill. For example, leachate and condensate sumps can accumulate explosive gases. Proper design of these mechanical/electrical systems and enclosure access points can help address these hazards. Also, appropriate signage needs to be installed to identify hazardous areas. 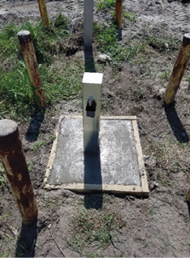 Landfill gas wells should be designed with grates at the top of the borehole to protect construction and site workers from falling into these areas. Every phase of landfill design should involve considerations of safety. Landfill designers should include features that minimize health and safety concerns associated with landfill construction and operation, including ways to configure landfills to allow for safe operation, access features to allow for easier and safer monitoring of the landfill’s environmental control systems, and design elements that provide appropriate protection against the hazards that develop in a landfill environment. In order to meet these objectives, landfill designers must be willing to work in close collaboration with field and operations staff to incorporate a design that is user friendly, effective and safe. Bob Gardner is a senior vice president of SCS Engineers, Long Beach, California, and oversees the firm’s solid waste practice nationwide. He has nearly 40 years of experience in solid waste management. The report highlights the company’s progress toward greener operations. Waste Management (WM) released its 2018 sustainability report Dec. 19. Titled “Change for the Better,” WM says the report highlights progress toward reducing the company's greenhouse gas footprint, recycling viability, technology utilization and helping employees, customers and communities to be safe, resilient and sustainable. In addition to the published report, WM also updated its interactive report microsite, which invites visitors to go on a digital journey to see the ways WM collects, processes and manages waste. The company’s continuing its focus on working to keep recycling environmentally and economically feasible for customers. WM has invested more than $1 billion in processing infrastructure alone, including almost $22 million in 2017, which is up more than $13 million year over year. This leadership resulted in 15.3 million tons of recycled goods in 2017, a 91.25 percent increase since 2007. To adapt to recycling challenges, WM worked to increase operational efficiencies and lower operating costs at recycling facilities and actively works with customers, communities and environmental organizations across North America to educate about contamination. One example of new recycling education efforts includes the launch of a “no plastic bags” in the bin campaign. More information can be found at https://recycleoftenrecycleright.com. WM is focused on growing a cleaner fleet. In 2010, WM committed to reducing emissions associated with its fleet by 45 percent by 2038. From 2010 through 2017, WM has reduced fleet emissions 28 percent. It is harnessing energy at the landfill. WM operates the largest fleet of heavy-duty natural gas trucks in North America, and nearly one-third of these vehicles run on 100 percent renewable natural gas generated from landfill gas. The company is focused on technology innovations. Investing in state-of-the-art routing technology to improve fleet efficiencies, WM says its fleet reduced miles driven by 2 percent. This equates to approximately 8.9 million fewer miles per year since 2017. Optimizing routes not only reduces our environmental impact but also increases the quality of service. To view the 2018 update, visit WM’s online sustainability report, sustainability.wm.com. To view past WM reports, visit wm.com/sustainability. To learn more about Waste Management’s direction and long-term commitment to sustainability, watch Jim Fish and other speakers on a live stream of WM’s ninth annual Sustainability Forum Jan. 31, 2019. One of the keynote speakers is Valerie Craig, deputy to the chief scientist and vice president of operating programs for National Geographic. Visit the Waste Management Sustainability Forum for more information. Industry leaders still remained confident, according to ABC's Construction Confidence Indicator. While construction industry leaders remained confident in the third quarter of 2018, optimism slipped relative to the second quarter, according to the latest Construction Confidence Index (CCI) released Dec. 19 by the Washington-based Associated Builders and Contractors (ABC). Approximately three in four construction firms expect that sales will continue to rise over the next six months and closer to one in 10 expect sales to decline over the next two quarters. Though many firms expect to become even busier, fewer than six in 10 contractors expect profit margins to increase, a reflection of rising human capital, materials prices and other input costs, ABC says. Despite rising labor costs, seven in 10 contractors expect to bolster staffing levels through the end of the first quarter of 2019. All three key components measured by the CCI survey—sales, profit margins, and staffing levels—remain well above the diffusion index threshold of 50, signaling ongoing expansion in construction activity along multiple dimensions, ABC says. “There are reasons for optimism,” Basu says. “The U.S. economy continues to expand, public construction spending has become meaningfully stronger over the past year and ongoing employment growth generates more demand for a variety of commercial space. There are also some potential events that could improve economic performance, including a federal infrastructure package, slower interest rate increases, a trade deal with China and the elimination of tariffs on steel, aluminum and other items. The company faces penalties of $23,280 after two employees suffered fatal falls. The U.S. Department of Labor’s Occupational Safety and Health Administration (OSHA) has cited World Wrecking and Scrap Salvage Services Inc., a demolition company headquartered in Town and Country, Missouri, for failing to provide fall protection after two employees suffered fatal injuries at a demolition site in St. Louis. OSHA says the employees were cutting pipes while working from a suspended scaffold in June when the scaffold collapsed. OSHA inspectors determined that the company – owned by Keith Hanford – failed to ensure that employees used a vertical life line and other fall protection; conduct regular inspections of the scaffold equipment; adequately train workers to recognize and avoid fall hazards; and properly ground an electric motor used on the scaffold. The company faces penalties of $23,280. “Providing fall protection for employees working at heights is not optional and can prevent tragedies,” says St. Louis Area Office Director Bill McDonald in a written statement. Under the Occupational Safety and Health Act of 1970, employers are responsible for providing safe and healthful workplaces for their employees. OSHA's role is to help ensure these conditions for America's working men and women by setting and enforcing standards, and providing training, education and assistance. For more information, visit https://www.osha.gov.